Here at Taco Truck Columbus central, we receive inquiries about other trucks in Ohio and out of state. People wonder if Columbus is some type of Taco Truck Oasis. So far, no trucks seem to be in Cincinnati or Cleveland. However, we were tipped off about a truck in Springfield (about 1 hour west of Columbus). A Taco scout brought in a menu with an address so there was no reason to defer the journey of discovery. This truck is easy to find, within sight of Springfield Regional Medical Center (a local landmark) and right next door to the (very) orange Beverage Depot. La Condesa has been open one year as of October 2009. The owners were not at the truck when visited and the employees at the truck were young and newer to the business so details were sparse. Several loyal gringo patrons were present, each one raved about the truck and one said that he eats there almost every day. 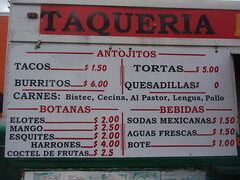 The menu is limited with a few less common items such as elotes, esquites and fruit cocktail. The most unique menu selection is the La Condesa approach to mangos: a mango with the skin removed covered with salt, lemon and hot chile. This was a first. All of the food sampled was very good and worth additional visits when we are in the area. Another plus for this truck are the beverage choices. 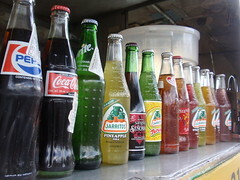 Granted, it is great to be next door to a beer store, but in addition to horchata and pina (rice, water and pineapple juice) La Condesa has the largest selection of Mexican soda pops encountered during our taco truck touring. Non standard choices include Mexican Pepsi, Sprite and an apple drink never encountered in either a Columbus taco truck or grocery store. The easiest way to get to La Condesa is to take I 70 west to the US 41 exit, (this becomes High Street when you enter the city) turn left at Burnett Road (just as you are passing the hospital) and look for an orange cinderblock building. We acknowledge that with the name, Taco Trucks Columbus, the expectation is that this is a site about….Taco Trucks in Columbus. However during our taco trekking we have developed an appreciation and deep respect for street food. So, since we are taking a reach with Springfield, why not go all out and mention a Hot Dog Truck. It is just a few blocks away from La Condesa and an argument can be made that the hot dog truck laid the foundation for taco truck acceptance in Springfield. If you are going to drive to Springfield, you might as well make it worthwhile. Big Jim’s will be open at the same corner spot for ten years as of April 2010. The owner, Jim Lopez also opened a restaurant during October 2009. This stand offers hot dogs, coneys, meatball sandwiches, excellent chili and a few other items. 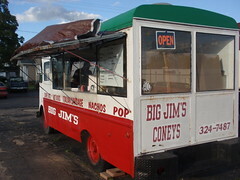 Jim is turning the truck over to his son Sam as he invests his efforts into his new restaurant venture. As our mea culpa for the lack of Taco Truck integrity I offer two things. First, this is a great hot dog truck. Second, Jim’s dad has a taco connection, he opened the first Taco Bell east of the Mississippi. Viva los Taco Trucks wherever we find them in Ohio and bless their other street food kin. This is fantastic – I just relocated to Springfield and can’t wait to visit the truck (I’m stoked about the elote). You guys just made my day. Thanks. Thanks, A Dayton area alternative! What?! You mean you’ve never come across Sidral? The delicious, refreshing apple soda! I’m excited to try the taco truck in Springfield. Good news. I also have heard rumblings about a truck potentially in Cincinnati. Taco CMH Gourmand Comment: It was not Sidral…some other soda company. Let us know about any Queen City Trucks you find, we’ll come down. Mi Bandera on 161 has a great selection of different sodas, if your interested. They have lots there that aren’t at any trucks I’ve seen. The apple soda is called Manzanita Sol. It is good and taste like carbonated apple juice. They don’t have it all the time, but most. Been to Big Jim’s a few times. worth the stop. Big Jim is also opening (or just opened) a little shop on the northeast side of SF. (mitchell/4) Haven’t tried it yet, as it is farther than his stand from our office. There is a “New Orleans Bourbon chicken” truck at the NW corner of N. Limestone and E. McCreight. Only stopped once, but it was good. Someone at work mentioned seeing a little buritoria on the north east side of town near where 4 comes into town. Somewhere near N. Belmont and Lagonda maybe? I need to find that one. There are a few trucks in Dayton, but I’ve not ventured that far to find them yet. Wonder if there are any near the base(wpafp)? That place on the north side is called Taqueria Don Julio’s. It’s in the old Harvester Inn at the end of Lagonda. Much bigger selection than La Condesa, although the food is more expensive. I have ate there a few times and prefer to go on Sundays as they have some non menu food specials. Nice english speaking lady works the counter and is very helpful. Thanks for the info on the chicken truck, have drove past it a number of times but have yet to stop. Have to make it a point to now. It’s the US40 exit, (exit 62) not US41. Either exit works. Or at least worked for me. Ah sorry, mentioned that as they’ve closed the 41->downtown street for a while due to construction. So it’s more convenient to take 40 for a few more weeks. Stopped there today. The Lengua Torta was sublime. First tried the taco truck about 6 months ago. Now our family of 5 eats their food 2-3 times a week. Nothing on the menu is bad and everything is cheap! Word to the wise: they often sell out of chicken late in the day. Don’t head over there after 7 or so and want pollo anything, it’s must be the most popular meat. They also have a small grocery store/market in at Burnett Plaza, plus a soon to be open sit-down restaurant at a different location in same plaza. Hours are from 11:00-11:30 to at least 8pm. I have drove past as late as 9:30 and they are still open. They are open 7 days a week and speak no english. For Springfielder’s there is also a La Taqueria near downtown on Columbia? Before you get to the Masonic Temple. It’s in the old lunch stand next to what use to be a Howard Johnson’s motor lodge back in the day. The restaurant is located right next to the street on a corner lot. Haven’t tried there yet. The Big Jim’s Coney/Sub front on Mitchell is open. Jimmy and son run it. They seem to know everyone who comes in. Note: if you order the cheese coney’s- get two, one just is not enough. Another great little place is Mic’s on Route 4. On the right hand side as you go out of town. Great lasagna! Reasonably priced. The y use to be where the Big Jim’s storefront is now. Had to move to a bigger location. This taco truck rocks! The chicken quesadillas are the best! They’re great, cheap and fast. It’s my favorite and I’ve been to many taco trucks, in Columbus and in Mexico, this is one of the best. Cincinnati will soon be getting its third taco truck when Taco Azul starts operating. The other two are Senor Roy’s Taco Patrol and Habenero’s. There is also a taco cart that is operated by Nada. The Taco Patrol and Habenero’s is nothing but Chipotle on wheels. In fact, I’d rather go to Chipotle. Very disappointing. I have no opinion on Azul as they have not started up yet, but they will not be serving the Hispanic community (unless they come to downtown or the college area), so form your own conclusions. We have no authentic Mexican in Cincinnati, trucks or otherwise. You have to go across the river to Covington or Newport, or travel North of the city into the suburbs. The La Condesa taco truck has been gone for about 3 or 4 months now, but I just got back from the sit down restaurant that is now open! They have the same menu as the truck had, with a few “higher class” additions. Prices on the original menu are unchanged. Plus you can still get Manzanita Sol, the apple soda! Big Jims is the bomb. The best cheese coneys in ohio loaded with cheese and sauce and onions little mustard and then steamed awsome. Sam also has a Italian steak sub that is off the hook also a 5-way chili that is like none other. Well worth the visit. Say hey to Sam. Open 11 to 4 during the winter, later in the summer. Yes, the taco truck is gone, replaced by the sit down establishment right there near where the truck used to sit. 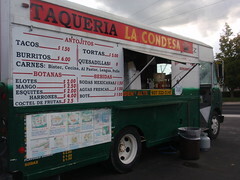 They Taqueria La Condesa is in the shopping center there by the big orange drive thru. The food is still spectacular and AMAZING! It is one of the places I cannot resist and find myself there at least once a week to chow down on the chicken tacos and quesadillas. Muy authentico…Springfield is lucky to have La Condesa. Note: The Truck is now a restaurant.